One thing that got me mostly surprised was to know that the Earth had multiple atmospheric layers, and contrary to the common sense, there are upper layers that are hotter than lower ones. This always caught my imagination, and I have been fascinated by this kind of subject ever since. After many years, I got to know a hobby that put me in direct contact with this childhood passion: High Altitude Balloonism, a.k.a. HAB. It is a hobby where people send unmanned aircraft into the stratosphere to take pictures and videos, to gather scientific data, having a pretty good time in preparing for the missions. It is an opportunity to learn a lot while we have tons of fun. One of the skills most needed in HAB is electronics: to design and build the flight instruments, the data logging modules, and to integrate with radio communication, cameras and GPS. I wanted badly to be able to carry out these tasks, to create my own balloon mission and to reach the stratosphere. But I hadn’t enough electronics skills to be able to successfully create this these devices. In this project, I have adopted an iterative development strategy. The first iteration will be all about creating the circuit’s base, as well as including a RTC clock and an onboard temperature sensor. 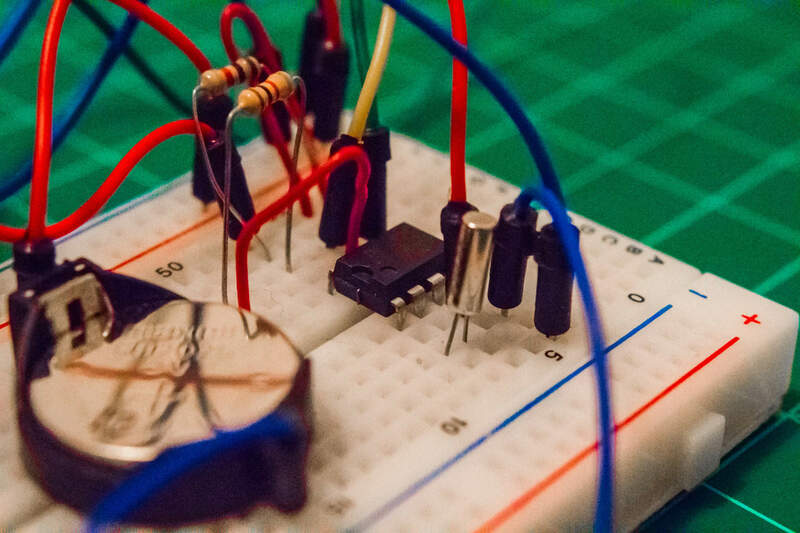 I am going to focus mostly on the circuit design and implementation, and in another article I will talk about the software design and engineering process. As I learnt from Oyvind’s ebook, Getting Started With Electronics, I can use the component’s datasheet to discover important information, as the voltage, temperature limits, and most important of all, a schematic of the typical circuit. I got DS1307’s and LM35’s datasheets, and there I got the schematics for their typical circuits. These layouts are pretty straightforward, and my main job was to integrate these two little circuits into one layout, and set a way for the board to communicate with the Arduino microcontroller. So I started out hand-drawing the two schematics, and connecting them in the supply lines. For both these integrated circuits, the input voltage is +5V. So they could share the input voltage and the ground. I also added an LED indicator, to show me when my circuit is on. I finally drew the connection from these components to a male header bus, to connect the board to the microcontroller. With this schematic in hand, I drew it in Eagle and generated the circuit board to send to a fabrication facility. There are plenty of fabrication services out there, which are not expensive and suit well for a hobby project like this one. You can find some suggestions in Oyvind’s article Cheap PCB Design Process. First, I wanted to draw a ground plane, to make all components share a common reference potential, but also to simplify the traces’ routing, by connecting each component’s ground directly to the ground plane. design an Arduino clone in the circuit board, to have autonomous life without the extra microcontroller board! I am going to follow your project with attention! Thanks for the comment. I think you would like a lot the follow-up on this project. Just keep in touch! I am so glad the you liked the post and it has inspired you to build some electronics too! Find some interesting ideia, gather the information for building it (this site is full of them) and just have fun! And I am looking to hear about your projects! Thank you for giving a fabulous innovative idea for data logging using balloon space craft. I hope you also give form to your marvellous ideias building electronics!